The Sun's gas swirls. The "handles" are prominences. If you looked at the Sun in a telescope, you could blind yourself. Sun light takes 8 minutes to reach us. Every second, the Sun turns over 4 million metric tons of gas into energy. The Sun is as wide as 109 Earths. The Sun is gas. You would fall in. The Sun is hot (5,500 Â°C or 9,900 Â°F). You would burn up. The Sun is a star -- ”the closest one to Earth. It is a large ball of very hot gas. The air we breathe and the helium in a balloon are both gases. The Sun is very hot. It is over 5,000 Â°F at the surface, and much hotter at the center. The Sun is made of mostly hydrogen (70%) and helium (28%). It turns more hydrogen into helium every second. The Sun makes light and heat that warms the surface of the Earth and makes plants grow. We can get food from plants, and we can burn wood and other parts of plants to cook, warm our houses, and make cars go. Without the Sun there would be no life on Earth. The Sun is very big - much, MUCH bigger than the Earth! It is more than a million kilometers or 109 Earths across and contains more than 99.9% of the Solar System's mass. If you could stand on the surface of the Sun, you would weigh 28 times as much as you do on Earth because the Sun is so big. More than a million Earths could fit beneath the surface of the Sun! It doesn't look that big from Earth, though. That's because the Sun is so far away. Compared to other stars, the Sun is about average-sized. The entire Solar System is inside the atmosphere of the Sun. A very thin solar wind of gases blows from the Sun all the way to the edge of the Solar System, until it hits the wind between the stars. The part we see when we look at the Sun is called the photosphere. It means a ball of light. We call it the surface of the Sun. But it is just very hot gas (about 5500 Â°C). This gas is less dense than the gases below it and glows from the light and heat passing through it. How does the Sun make light and heat? The Sun is the main source of energy for the Earth. 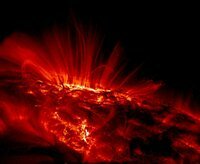 This energy is made deep inside the Sun in a process called nuclear fusion. Four hydrogen atoms are fused together to make one helium atom. Some of the leftover matter turns into energy. This is the same way energy is released in a hydrogen bomb. Core: The center of the Sun is very dense. It's about 12 times as dense as lead. It's also very hot - about 15,000,000 °C. This region is where most of the nuclear reactions are taking place. Radiation zone: In this zone the light, heat, and X-rays produced in the core fight their way out towards the surface. The gases that make up the zone are very dense and keep absorbing and emitting the rays. Have you ever tried to run through water? That's what it's like for light waves in this region of the Sun. It can take a single ray of light a million years to get out of this zone. Convection zone: Have you ever seen the air shimmer above a fire? Perhaps you've been told it's because "heat rises"? It is the hot air that is rising. Hot gases get lighter and rise. Cold gases get heavier and sink. In this zone, the gases are less dense. They behave like air on Earth. Gas at the bottom of the zone gets heated up from below. It rises up, cools off a little, and sinks again. Sometimes some rising gas and falling gas bump into each other, but most of the time they form currents like those in Earthâ€™s oceans and atmosphere. The currents are called convection cells. Sunspots look like dark spots on the Sun. But they are still bright â€” brighter than lightning. They are a little cooler, too. But they are still hot â€” about 2000 Â°C (3600 Â°F). Spots are caused by changes in the Sunâ€™s magnetic field, and usually form in groups which are carried around the Sun as it rotates. The number of sunspots we see goes up and down every 11 years. Sometimes, prominences and solar flares form in or near sunspots. What is the solar atmosphere like? Above the photosphere, the Sunâ€™s gases are not very dense at all. There are two layers that we can see with special telescopes. Above that, gases stream out as solar wind that reaches to the edge of the Solar System. If you have a telescope with special filters, you can see bumps around the edge of the Sun. Each one of these is called a prominence. They look like volcanoes erupting. They are hundreds or thousands of kilometers long. Some are bigger than the Earth. They often seem to come from sunspots. Sometimes they get so far away from the Sun that they fly away from it. Then they are called solar flares. Chromosphere means "color ball". It is just above the photosphere. It is not as bright as the photosphere, and you canâ€™t normally see it. But you can see it just before a solar eclipse (only with special filters!). It looks like a flash of all the colors of light. Corona means crown. 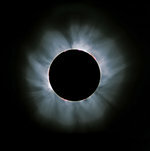 And that is what pictures of the corona look like. It is just above the chromosphere. It is hotter than the photosphere, and it glows. It is made of thin gases, and blows away as solar wind. It shifts and changes, but it is hard to see, even with special telescopes. At the top of the corona, some of the gas blows out as solar wind. It blows fast â€“ about 60 km per second (more than 100,000 miles per hour). But there isnâ€™t very much of it. If you tried to breathe it, you couldnâ€™t. The solar wind is strong enough to push dust and gas away from a comet to make a tail. The solar wind can even push big things. In 1960, the satellite Echo I was put into orbit. It was a large balloon. Because it was so large and light, the solar wind pushed it around in its orbit. In the future, some space craft may use the solar wind to travel between planets using solar sails similar to the way sailboats use the Earth's wind in their sails to cross the ocean. Heliopause means where the Sun stops. It is where the solar wind hits the wind from other stars. Near here, the solar wind slows down suddenly. In May 2005, the Voyager I spacecraft went through this region and felt a big bump. It is now just inside the heliopause. Because this happens so far from Earth, it is hard to study! Did you know the Sun had weather? Earth weather is what is going on in Earthâ€™s atmosphere. Solar weather is whatâ€™s going on in the Sunâ€™s atmosphere. The Sunâ€™s atmosphere goes to the edge of the Solar System, so solar weather affects us on Earth. Solar weather (also called space weather) includes sunlight, solar wind, X-rays, and radiation. Solar flares shoot a lot of very hot gas out from the Sun. If a flare hits Earth, it is called a solar storm. It could cause electrical blackouts or block radio signals. It could damage satellites in orbit. Radiation from a bad solar storm could kill astronauts if they were not protected. The Earthâ€™s atmosphere usually protects us from flares. Solar flares can also cause an aurora. Auroras look like beautiful curtains of shimmering light. They are called Northern Lights if they are near the North Pole. They are called Southern lights if they are near the South Pole. Solar weather affects other planets, too. We have pictures of auroras on every planet except Mercury and Pluto. Just like we can get Earth weather forecasts, we can get Solar weather forecasts. Forecasters study the Sun to figure out when flares will happen. They try to tell when solar storms will hit Earth. 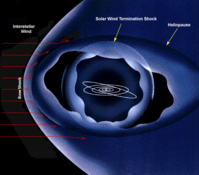 They also try to tell when solar storms will go to other parts of the Solar System. This is because space craft are always out there. Some of them can protect themselves if they are sent instructions. 1) On the sun you would weight much more because of the greater force of gravity. How many times you weight would you be? 2) The center of the sun is very dense. It is much more dense even then lead. How many times denser is it than lead? 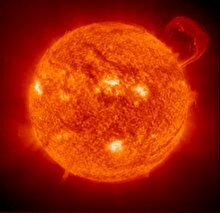 c) the sun is a hot ball with an internal temperature of about 10,000 degrees F.
5. How does the sun make light and heat? 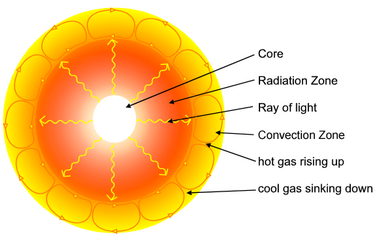 b) deep inside the sun in a process known as nuclear fusion, similar to a hydrogen bomb.